The Vancouver Bach Choir joins the Orchid Ensemble for an intensive residency culminating in a performance at the beautiful St. Andrew’s-Wesley United Church. The Orchid Ensemble blends ancient musical instruments (zheng, erhu and percussion) and traditions from China and beyond, to create an innovative musical genre based on the cultural exchange between Western and Asian musicians. The concert will be led by our Associate Conductor, Kathleen Allan. Ms Allan has assembled a program that draws inspiration from one of the featured works, El Ginat Egoz, that speaks about fertility and abundance in the natural world, and human love as a reflection of nature. The program pairs 5 new works created for the Orchid Ensemble with works from the Renaissance on the same subject. Multiple worlds, times and sonorities come together in an exciting fusion of musical cultures. The program will be capped off by a world premiere by local composer Rodney Sharman. Mr. Sharman’s contributions to the Canadian arts landscape were recently recognized through the awarding of the Walter Carsen Prize for Excellence in the Performing Arts and we are delighted to be working with him. We look forward to presenting a concert that mirrors the cultural diversity of Vancouver and showcases the depth of talent present in our city. See the explorASIAN 2018 festival guide. 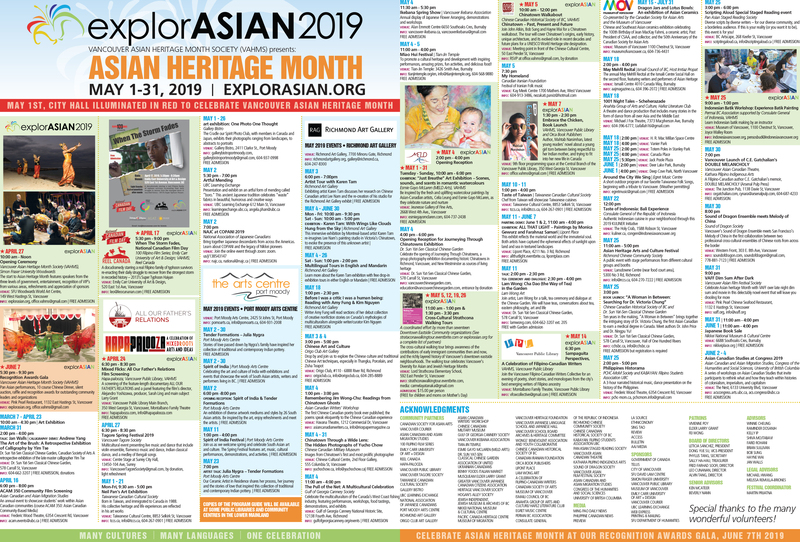 See the explorASIAN 2018 interactive calendar of events.